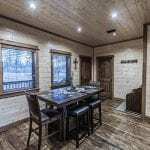 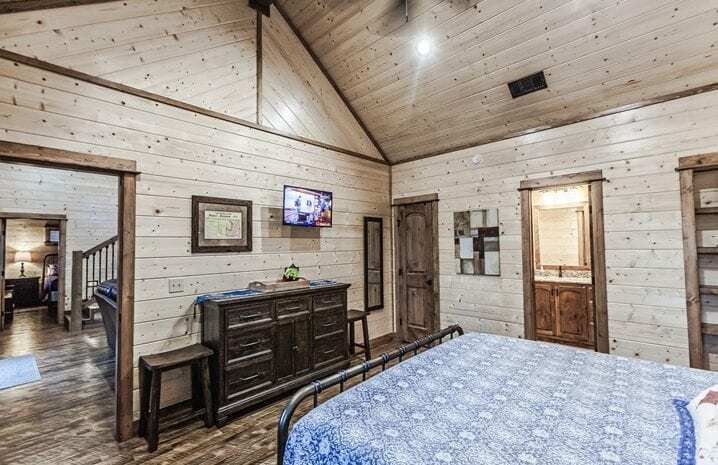 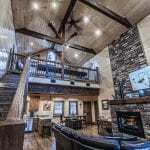 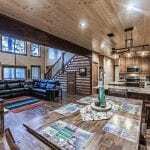 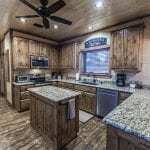 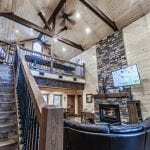 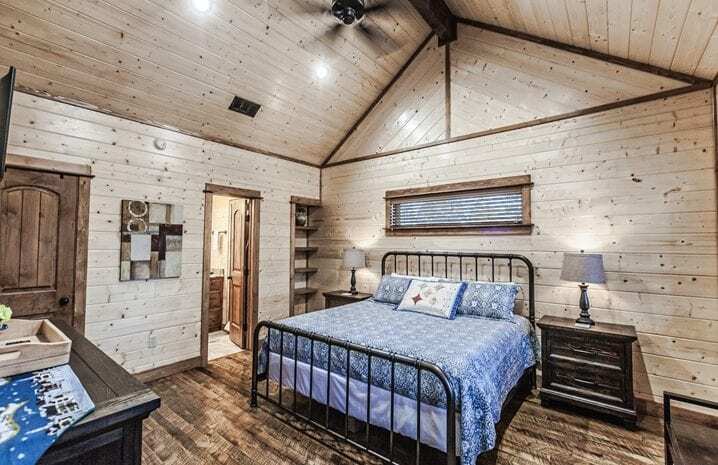 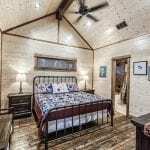 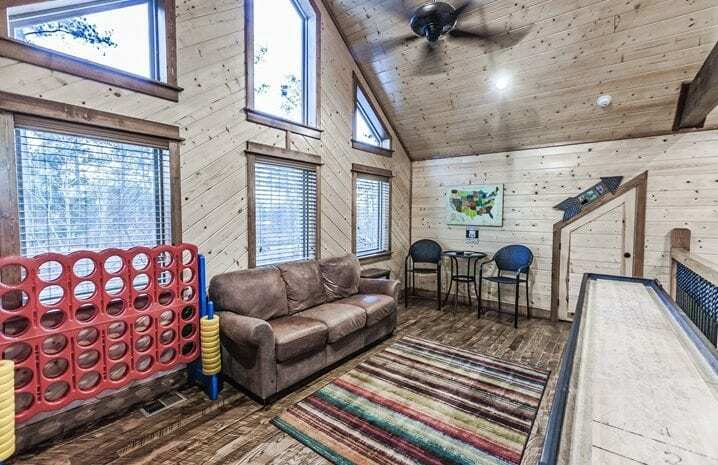 Great Cabin for Families and Couples – accommodating up to 8 guests within two bedrooms, Kid’s Bunk Hideaway in Loft, and 3.0 baths. 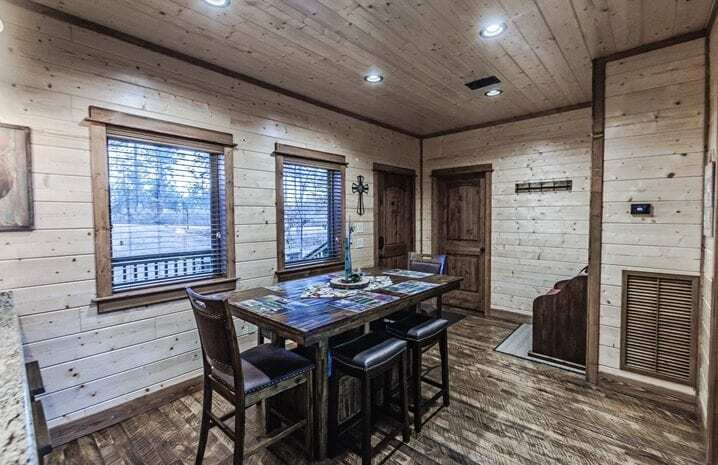 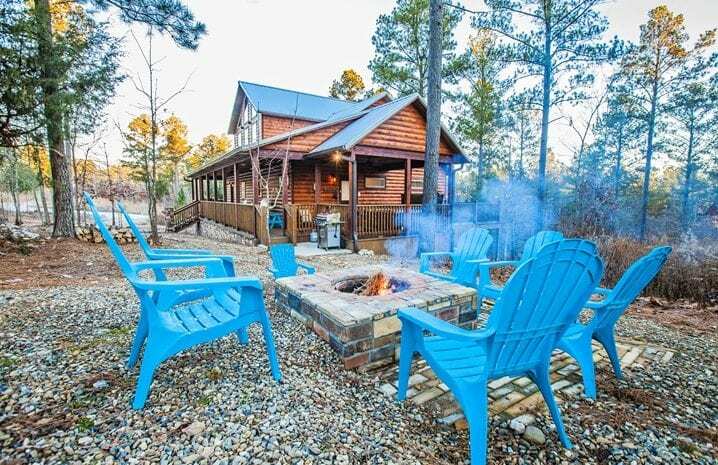 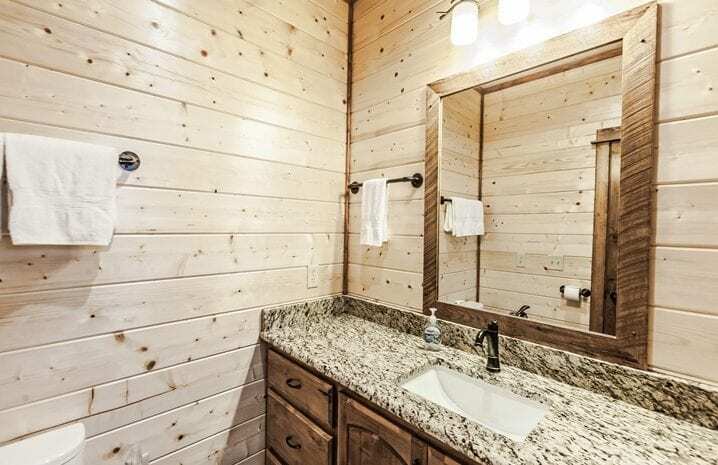 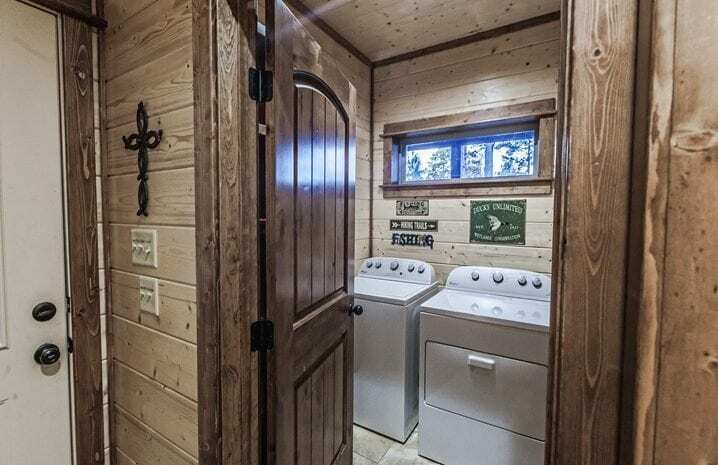 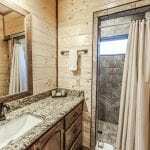 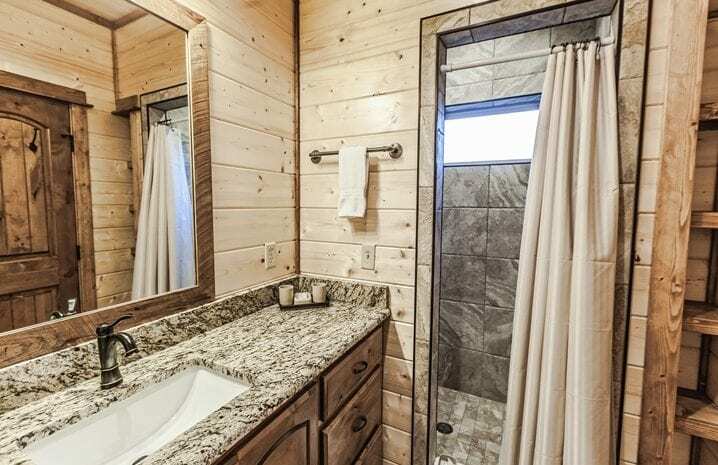 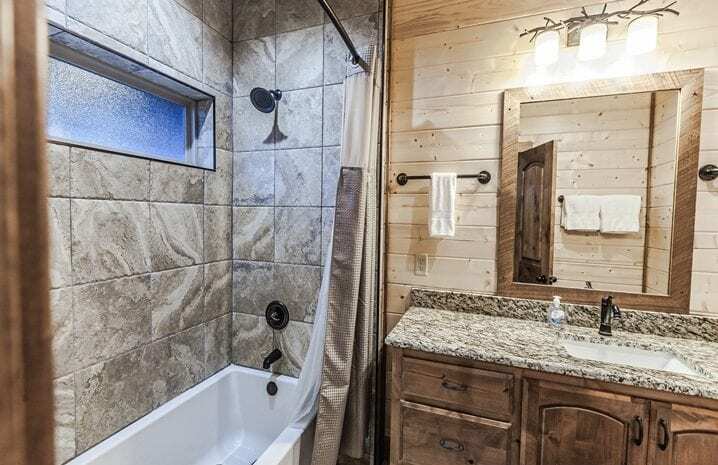 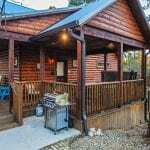 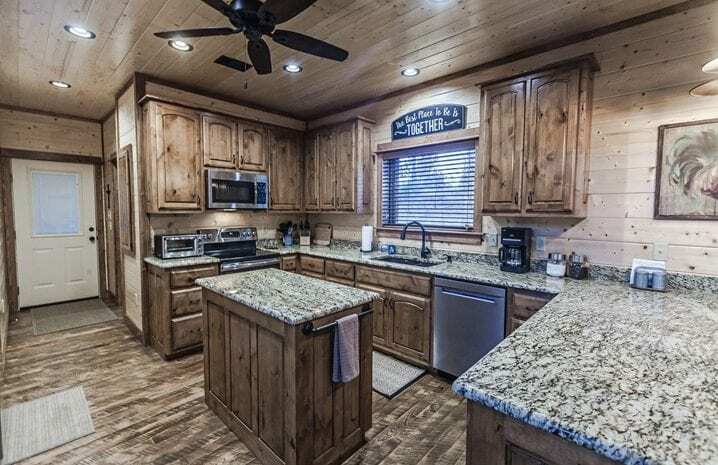 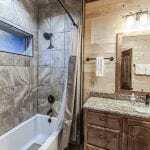 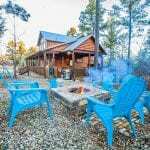 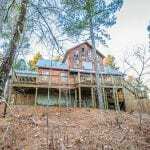 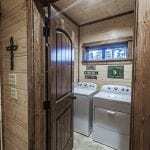 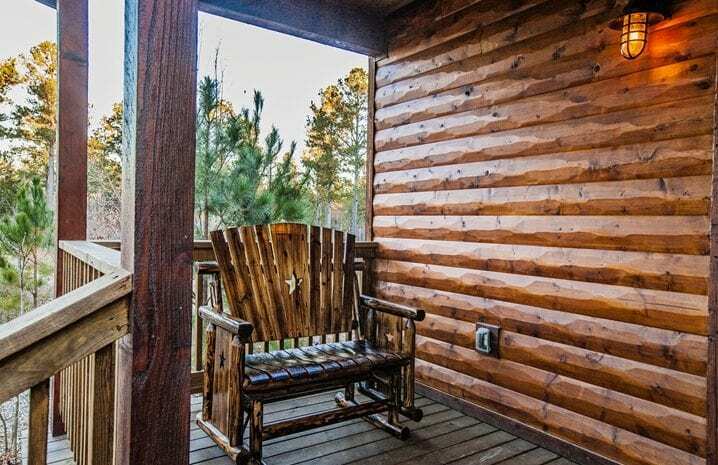 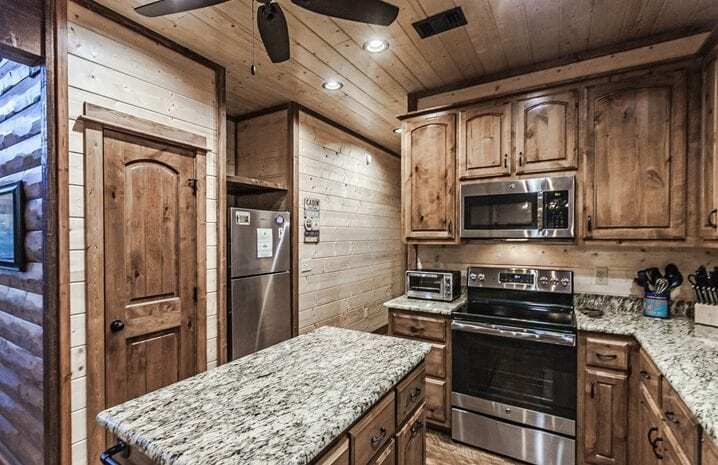 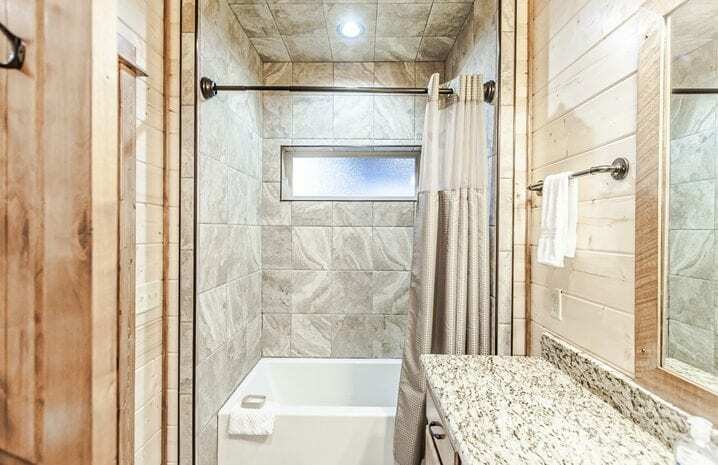 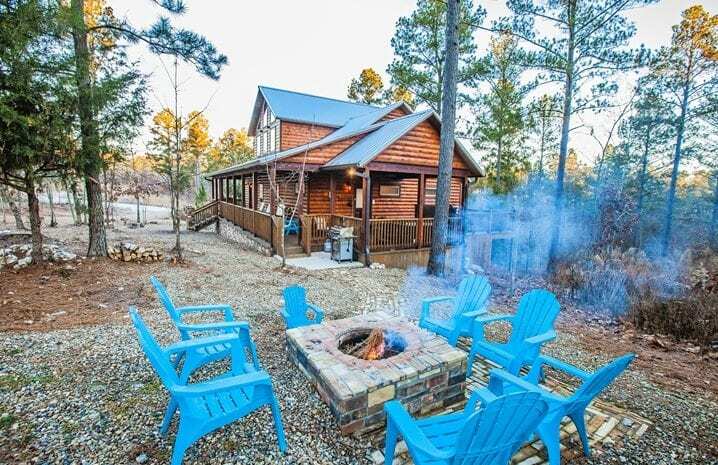 The new Happy Tree Cabin offers many amenities and is located on a deep corner lot with dense Pines and hardwoods. 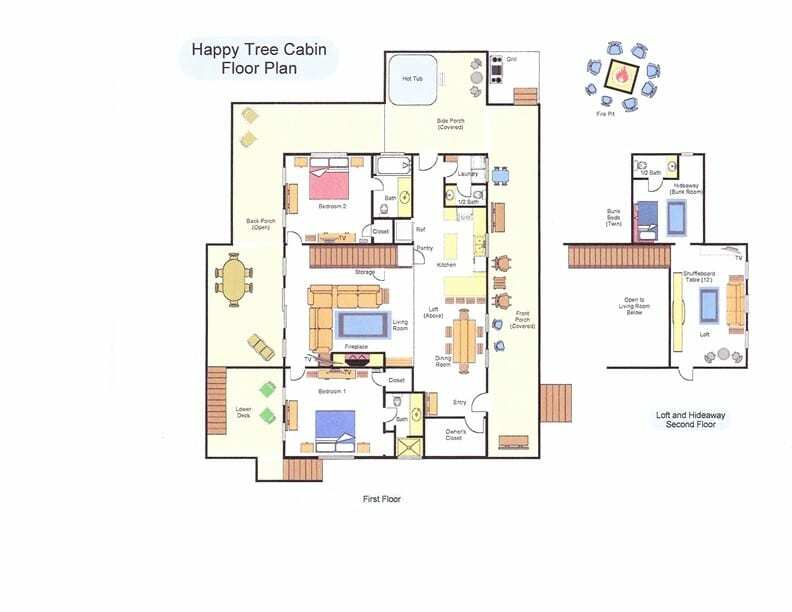 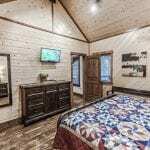 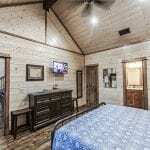 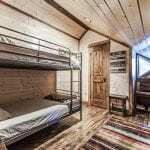 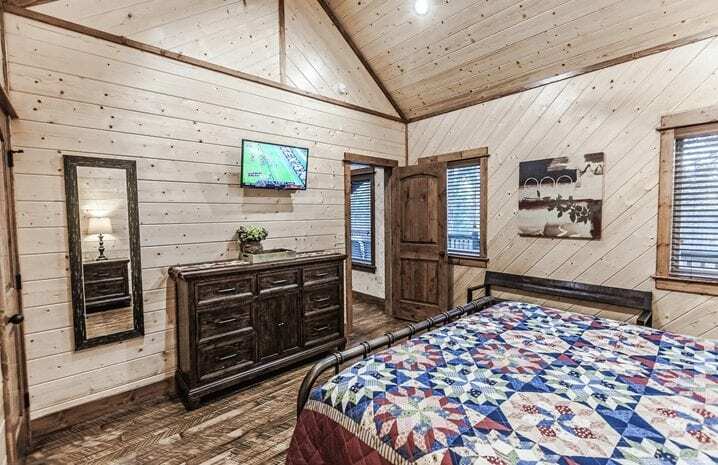 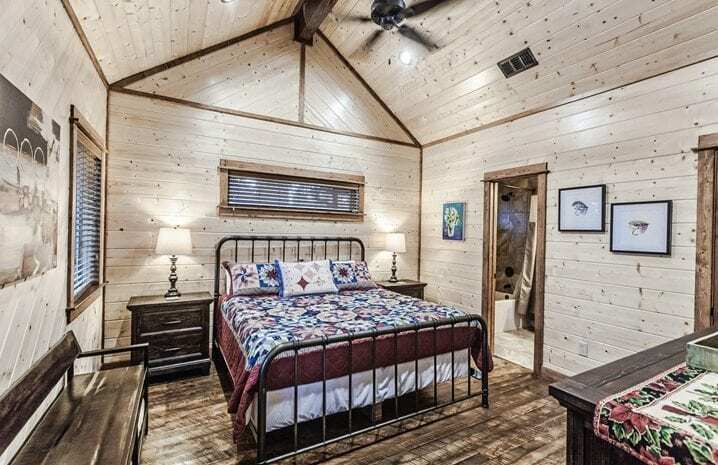 Happy Tree Cabin is a 2 bedroom cabin, sleeping up to 8 with 2 King Beds, 2 Twin Beds, and 2 twin roll-a-way beds. 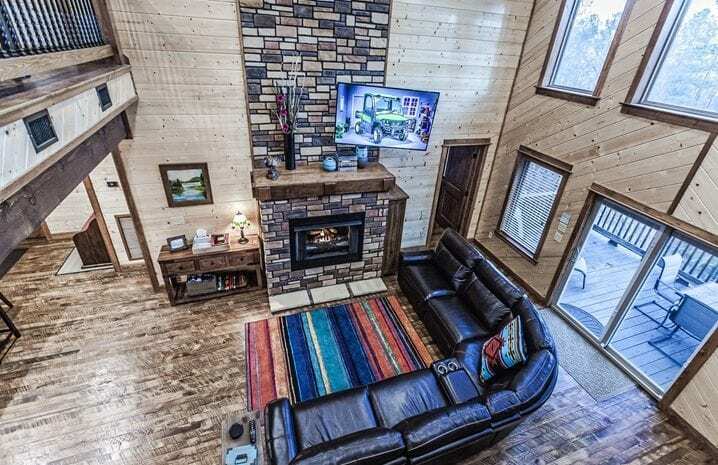 The Great Room is tall with an overlooking loft area and large view windows. 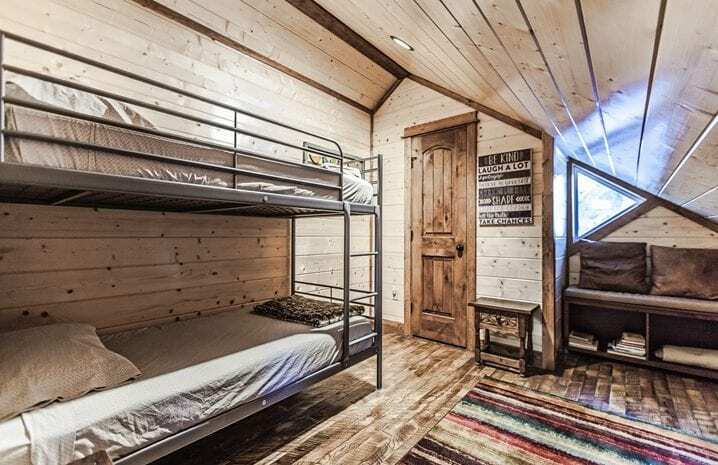 A kid’s Hideaway is a great kid’s area, located in the loft with a bunk bed and a 1/2 bath. 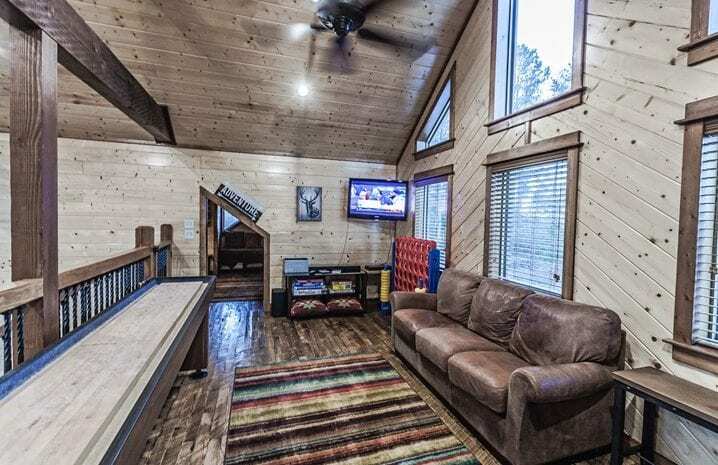 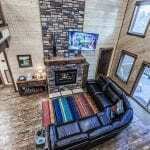 The loft is a great play area and has a TV and Shuffle Board Game for Adults and Kids. 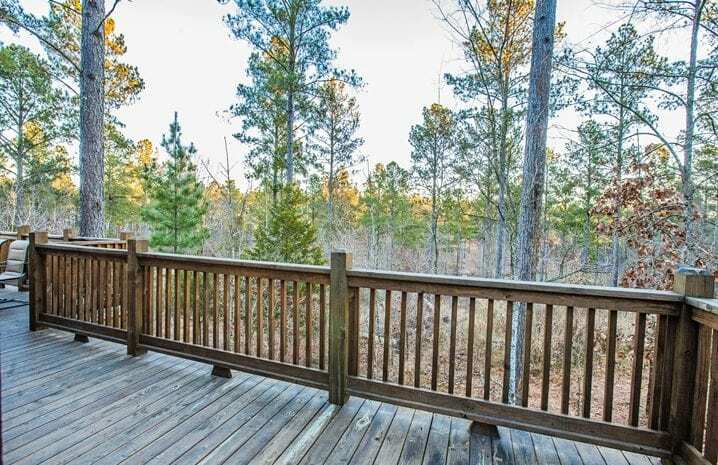 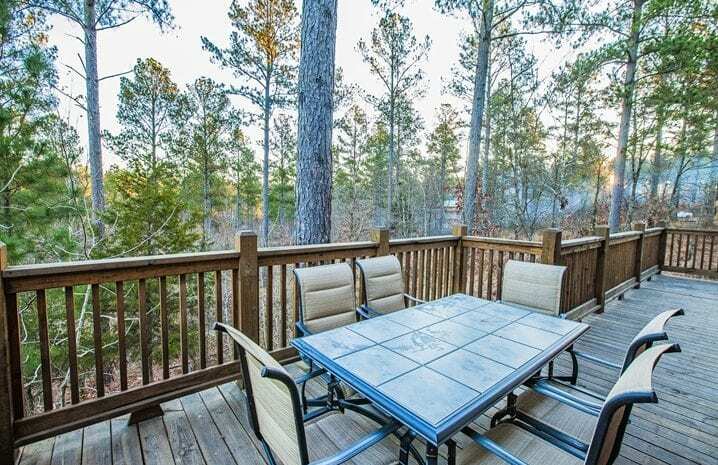 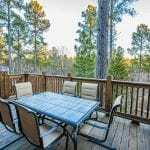 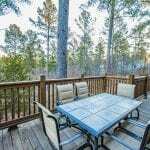 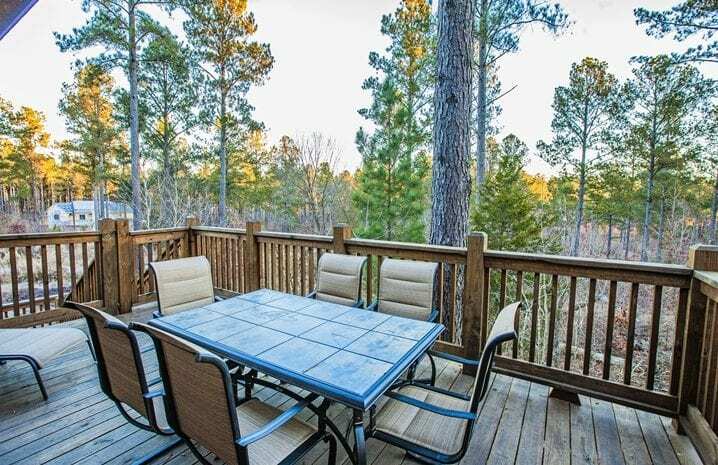 The back deck overlooks the forest and is a great spot to enjoy the scenic outdoors and dining at the 6-chair dining table. 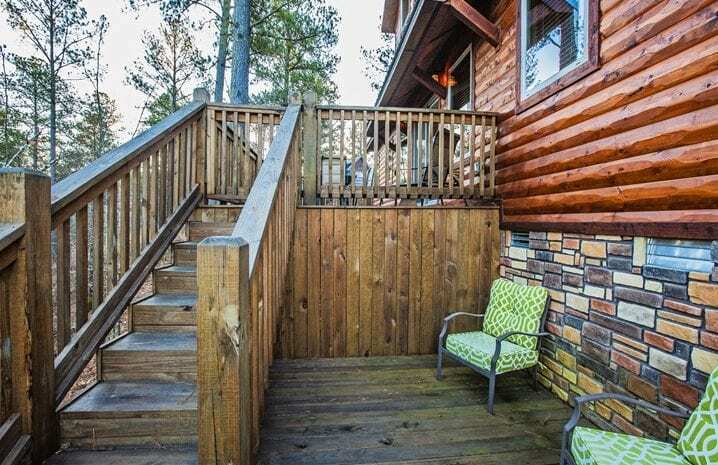 The wrap around deck is multi-level with comfortable chairs. 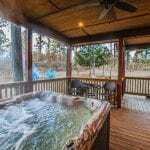 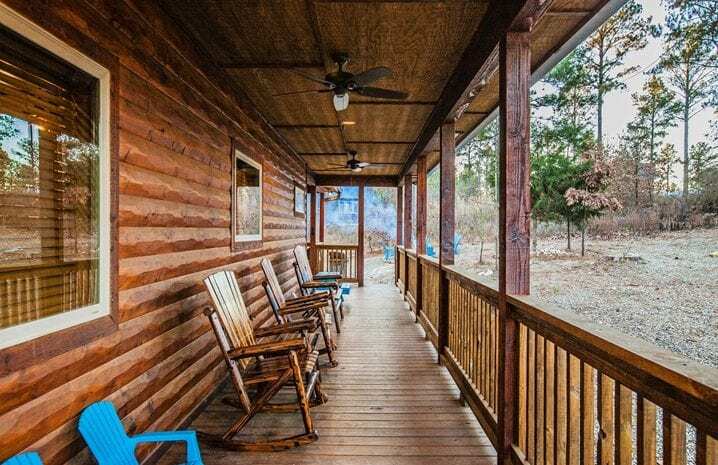 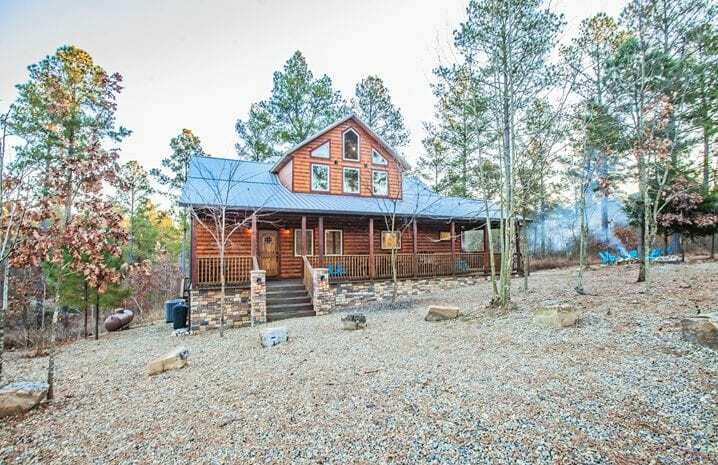 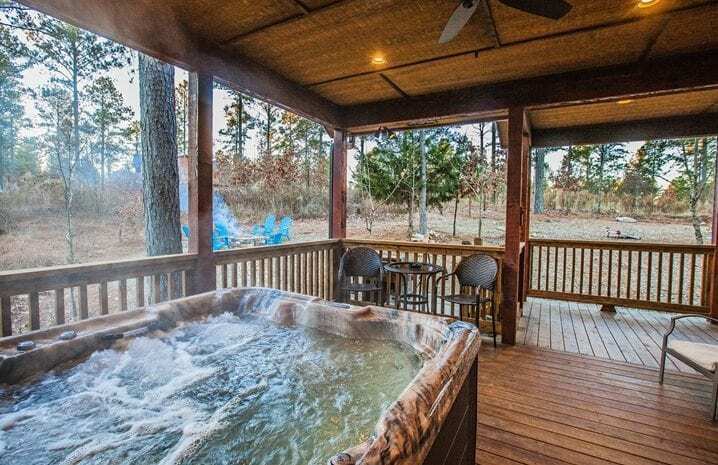 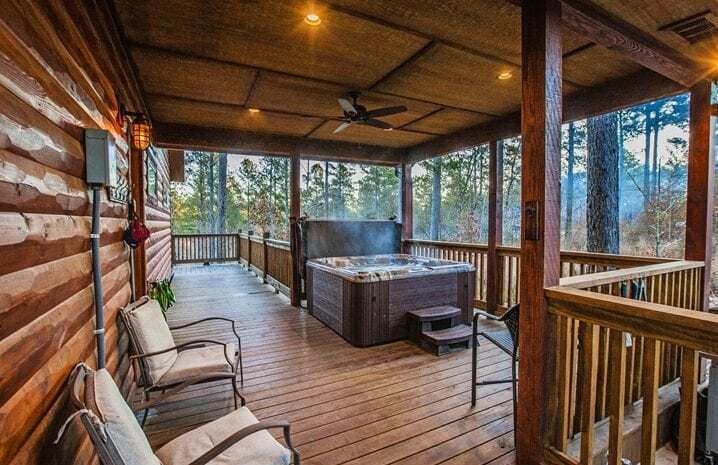 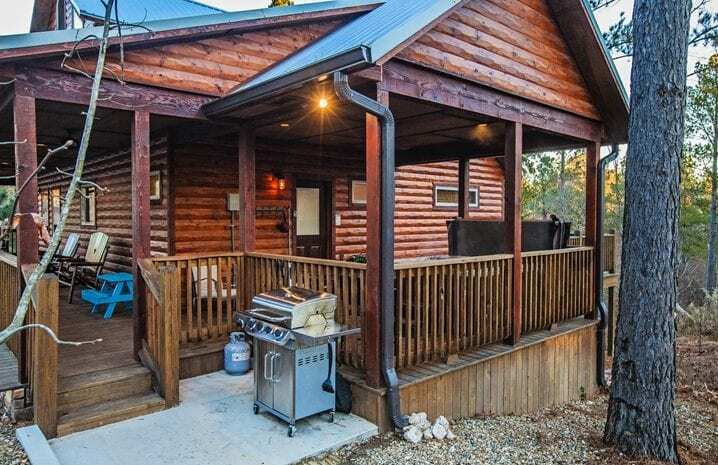 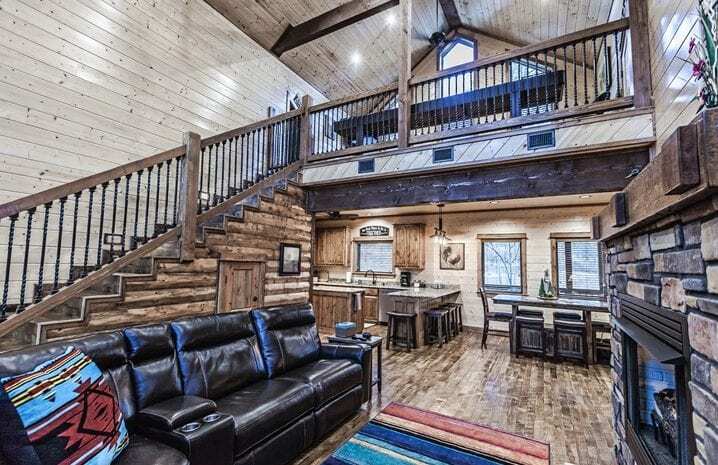 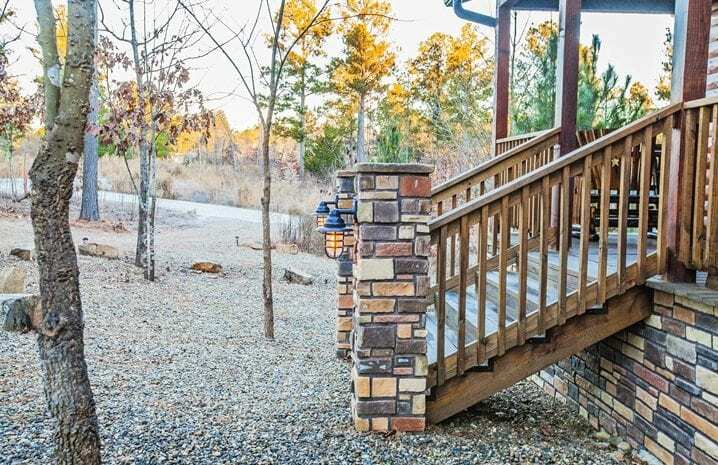 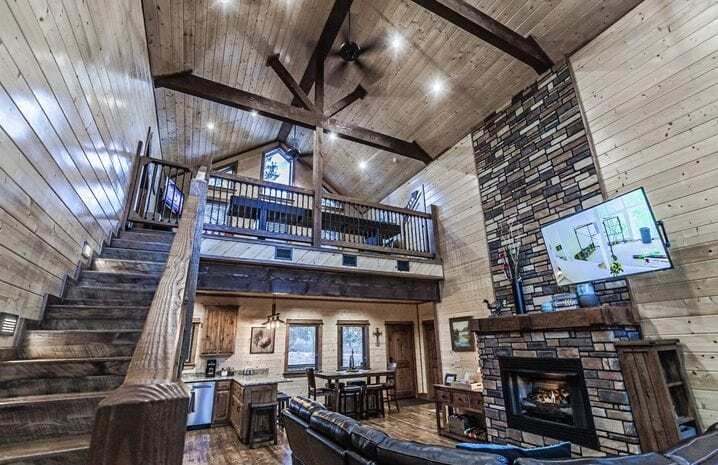 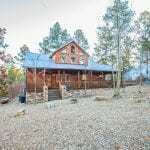 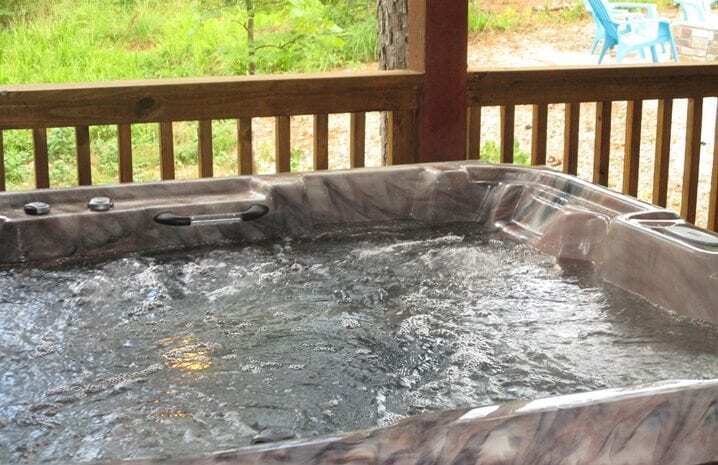 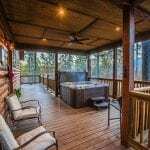 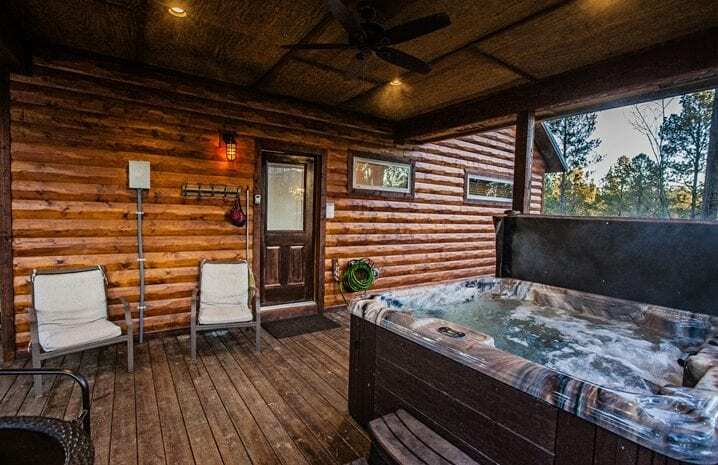 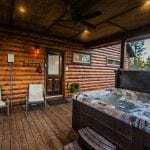 Along the side of the cabin is a spacious covered hot tub, rock fire pit and a gas grill. 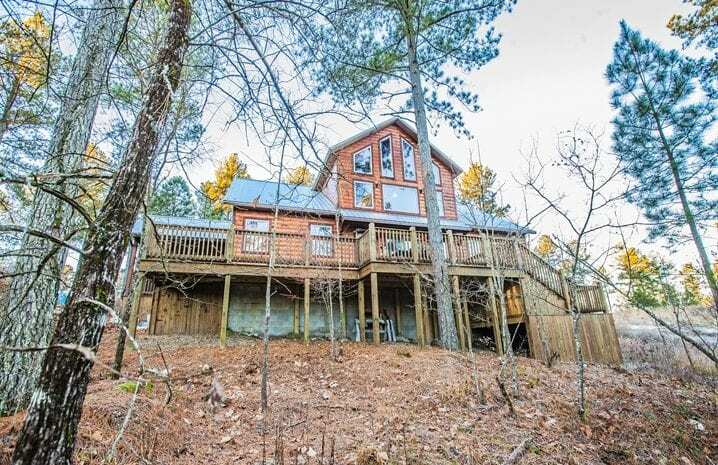 The 1.5 acre lot is deep and wooded. 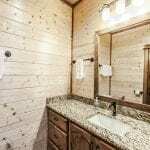 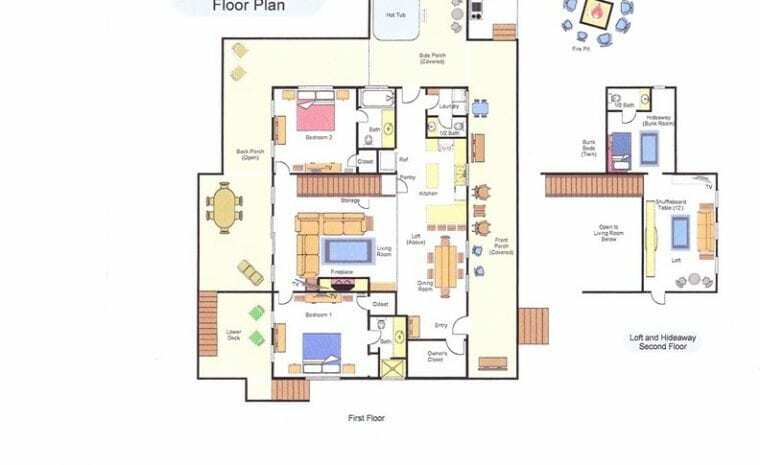 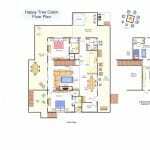 The two Master Bedrooms are on the first floor, both with HDTVs and spacious master baths. 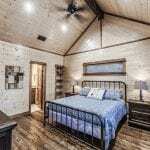 King Beds are located in the 2 downstairs Master Bedrooms and twin size bunk bed is are upstairs in the kid-Hideaway. 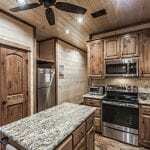 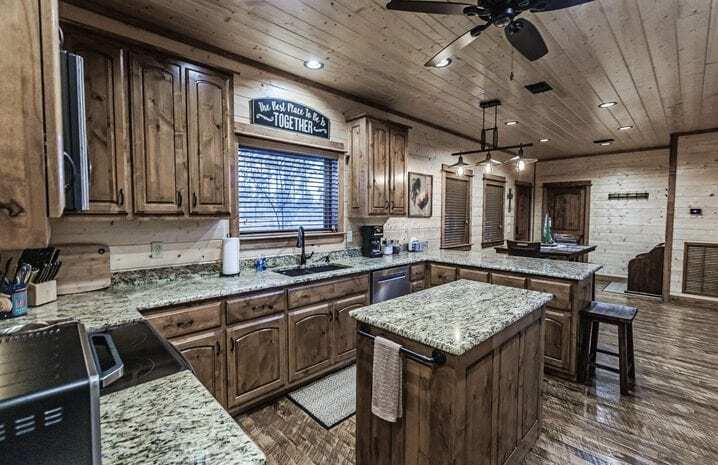 The kitchen is fully equipped and includes stainless steel appliances. 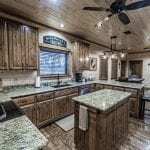 A 6-chair wood-crafted dining table is just off the kitchen; 4 bar stools are conveniently located at the granite kitchen counter. 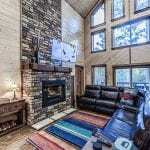 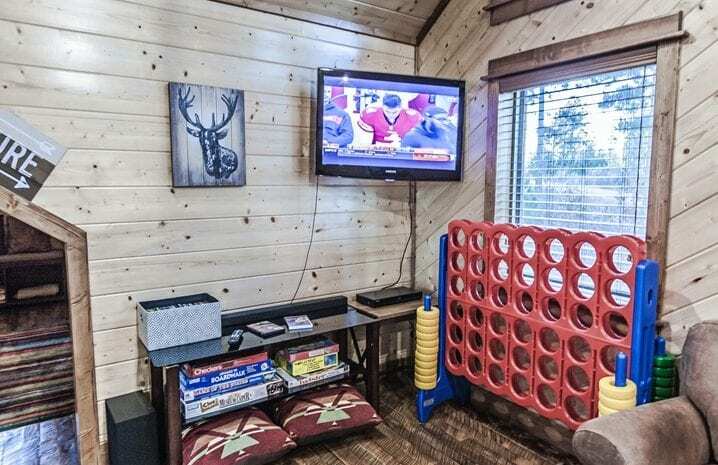 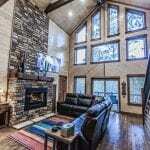 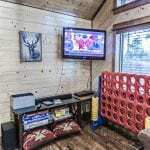 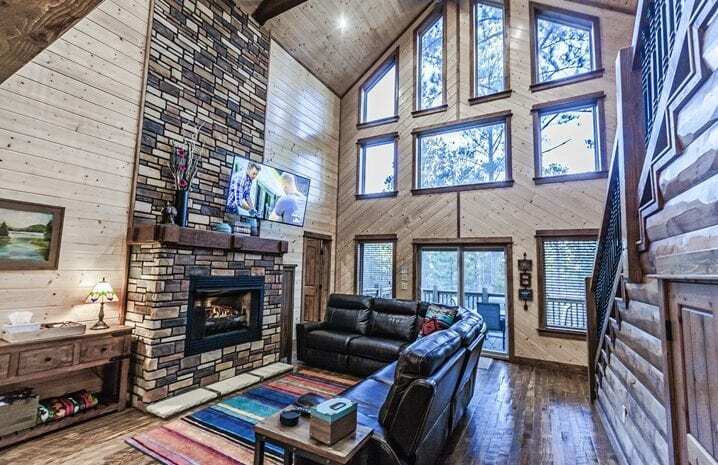 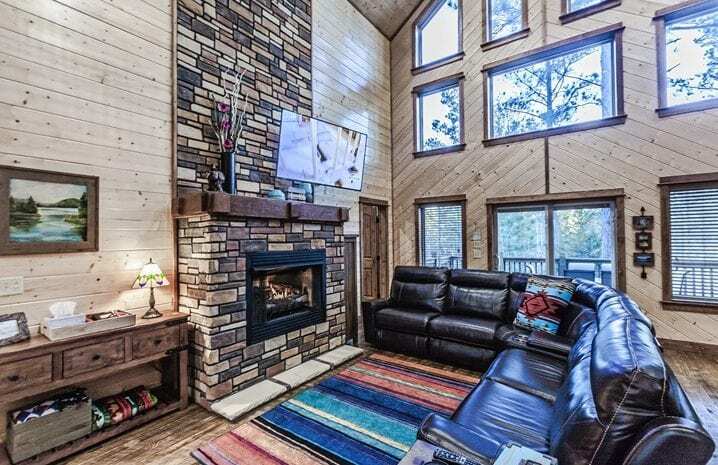 Happy Tree Cabin offers WiFi, and 4 TVs with local and movie channels. 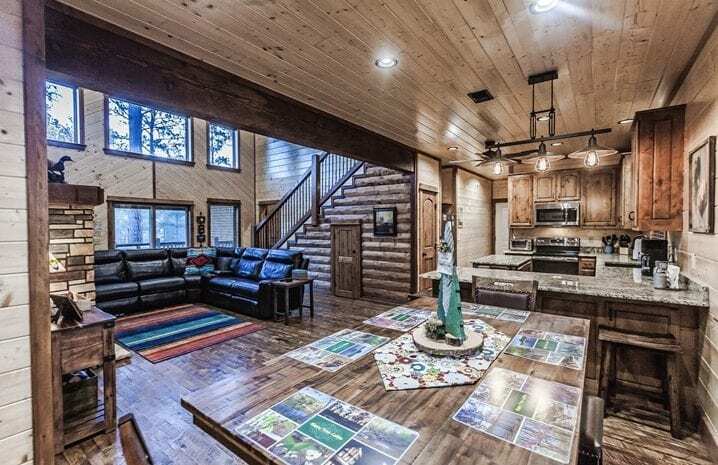 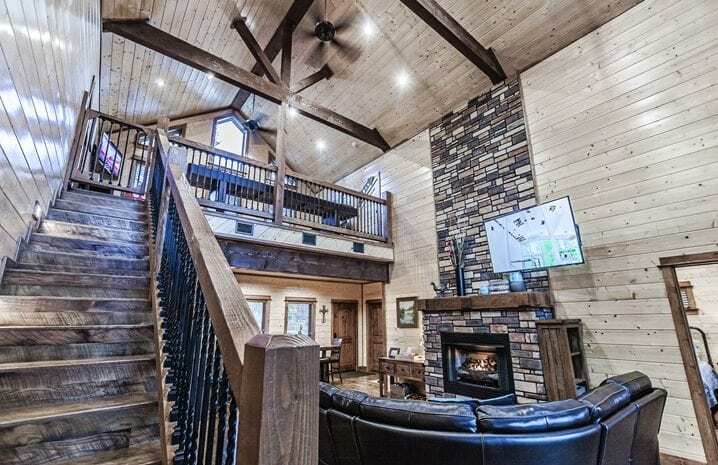 The cabin is fully stocked and there are no fees. 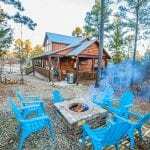 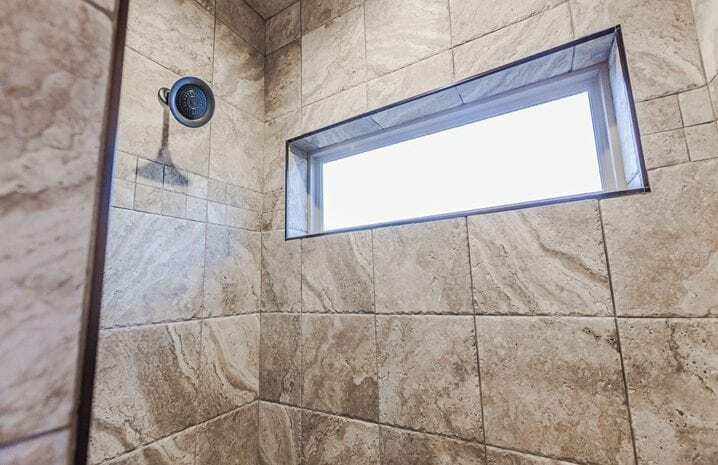 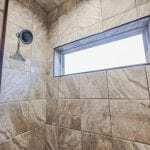 Happy Tree Cabin is conveniently located in Eagle Mountain, next to Timber Creek Trails, close to the Timber Creek Trails Shopping Center. 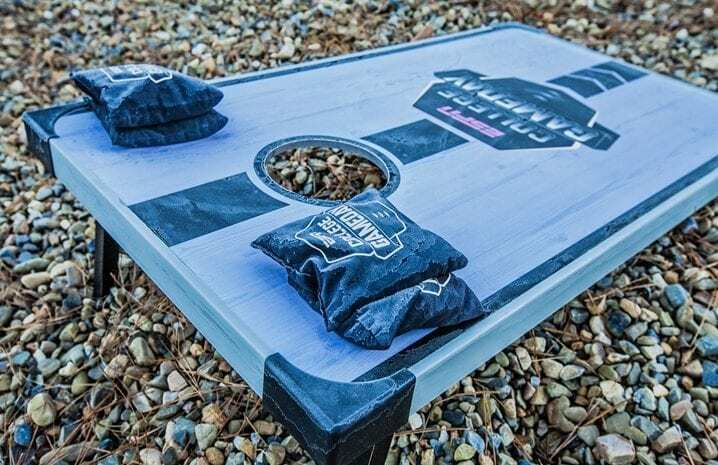 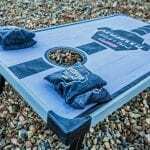 Here you will find great dining, a microbrewery, Shuck Me (fish restaurant), Escape Game, and specialty shops with ice cream, coffee and pastries. 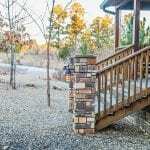 Broken Bow Lake and the Beavers Bend Resort Park areas are close by. 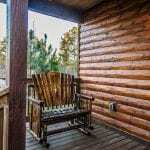 Hochatown, with all its tourist attractions, is within 3 miles. 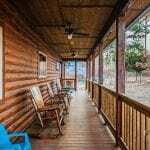 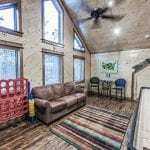 Do you have questions about Happy Tree Cabin?